alaTest has collected and analyzed 21 reviews of LIFX Z White and Colour Wireless Smart Lighting Adjustable Colour Changing LED Light Strip & Base Starter Kit with Built-in Wi-Fi, 15W, 2 Metres. The average rating for this product is 4.2/5, compared to an average rating of 4.5/5 for other products in the same category for all reviews. We analyzed user and expert ratings, product age and more factors. 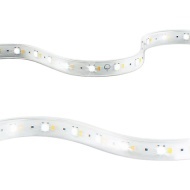 Compared to other products in the same category the LIFX Z White and Colour Wireless Smart Lighting Adjustable Colour Changing LED Light Strip & Base Starter Kit with Built-in Wi-Fi, 15W, 2 Metres is awarded an overall alaScore™ of 89/100 = Very good quality. Compelling addition to your current lighting scheme! Fun lights, but not straightforward!